There's a good Boxster number as well as a Turbo number. Just looked at previous results, they are selling for between 4-10 times the estimates?!!! WTF??!!! There isn’t even a Trevor plate in there! I'm not sure if that includes all fees and taxes, or just the hammer price. “911 jerk” probably gives the wrong vibe and fuels stereotypes!! 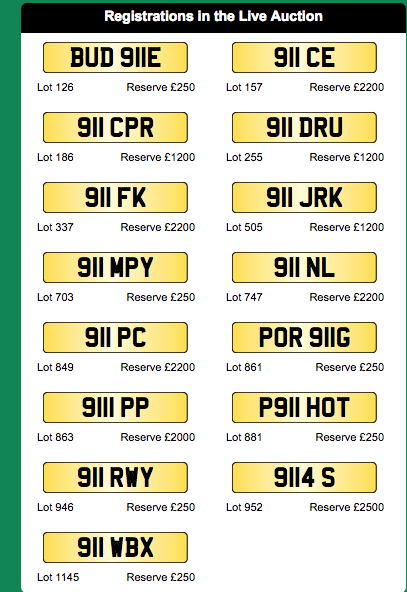 The reserves are set ridiculously low, I wanted a 911 number initially and 911 RAM went for nearly £10k inc taxes. The plate I got came up late on Friday afternoon and I was told the prices are softer then as a lot of people have bought and gone home. Cheaper to change your name by deed poll for £15.